We are again heading into the Holidays with all the over indulgence that entails. Whether you celebrate the end of the old year and the arrival of the new as a religious or a cultural event, it is a time for celebration. And what better way to celebrate than with food and drink? Unfortunately, all too often moderation goes out the window and with the good times comes full bellies, upset stomachs, and the occasional hangover. Here at Land of the Dead we have been in serious training for the Holidays since Thanksgiving. Over the next few weeks you may head to the medicine cabinet more than once seeking some relief from a modern pharmaceutical, but have you considered a fossil for what ails you? For millennia fossils, although not recognized as the remains of past life, were part of the repertoire of therapeutic treatments for diverse medical maladies; epilepsy, plague, preventing poisoning, snakebite, convulsions, phlegm of the head, childbirth pains, heart tremors, asthma, tooth aches, venereal disease, back pains, small pox, and many others. Amber is the fossilized sap exuded by several different kinds of coniferous trees. However, its nature and origin was long misunderstood. Because of its yellow color and being found in the ground, amber was though to be the urine of the European lynx turned to stone. Supposedly it hardened as soon as the Lynx urine contacted the ground. The Lynx covered it with dirt “from a certain constitutional meanness, for fear that the piss should be useful as an ornament to the human race” (Duffin 2008: p. 15). 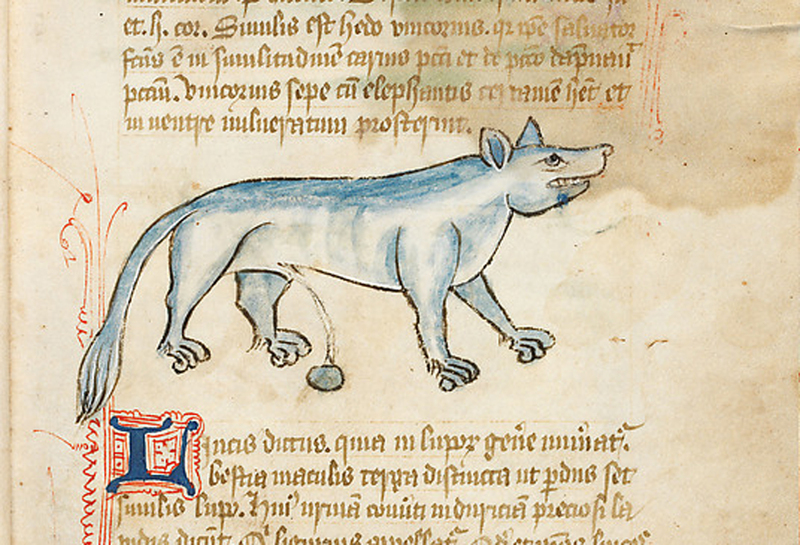 Illustration of urinating European lynx in a medieval manuscript. Note that urine is turning into stone (lynx stone) upon contact with ground. Because of its supposed origin as urine, Lynx stone was widely used, in numerous formulations, to treat bladder stones. 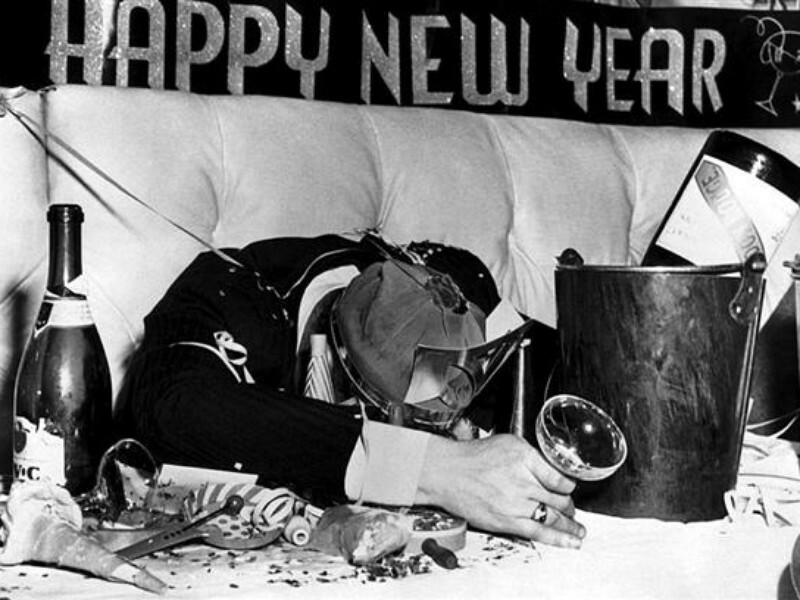 However, other applications of more interest to holiday revelers include treatment for stomach aches and headaches (either by sucking in the mouth or ground up and drunk in wine, water, or beer following a light breakfast). Medieval toadstone ring with large central tooth crown and two smaller lateral crowns. The truth about toadstones revealed. 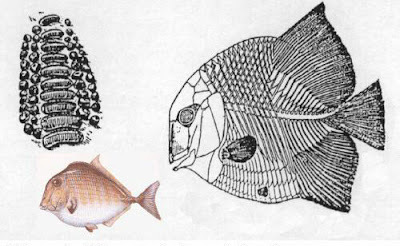 Left, specimen of large seminonotid fish Lepidotes maximus. Right, semispherical tooth crowns of Lepidotes, the "toadstones." Teeth of fossil fish known as pycnodonts were reported to be collected from inside young swallows just out of the egg. 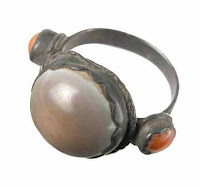 Once obtained, they needed to be protected from contact with water, earth, and other stones. Worn on the body, they cured headaches, among other things such as rendering futile the wiles of goblin visitors. Teeth, skeleton, and life restoration of a pycnodont fish. 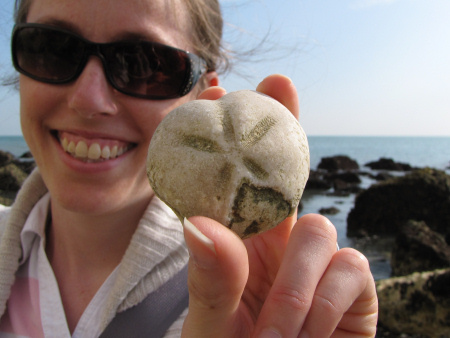 The spherical exoskeleton of sea urchins are common fossils in some ancient marine deposits. They are particularly abundant in the thick Cretaceous chalk beds near Kent, England. Crushed, mixed with a liquid, and drunk, these “eggs” were a cure an acidic stomach. Oddly enough, there may be some truth to that claim, as the chalk beds are composed of calcium carbonate, the active ingredient in modern antacids such as Tums. A chalk egg sea urchin fossil from the chalk cliffs of Dover. The Middle Cambrian Wheeler Formation in Utah preserves the staggeringly abundant remains of the trilobite Elrathia kingi. At least one Native American burial contained an Elrathia fossil with a hole drilled through its cephalon, probably for stringing on a necklace. Phhvant Native Americans recounted that older Indians wore such objects to help with many sicknesses, including sore throats. St. Phanourios is a Orthodox Catholic Saint who died on Cyprus. Many fossil hippo bones have been discovered along the north coast of that island and these have been revered as the bones of the saint. Given their supposed holy nature, local villagers collected bones, powedered them, and drunk them mixed with water --- a concoction that cured nearly every known malady. This was apparently still being done as late as the 1970’s. Ironically, the scientific name for the fossil hippo is Phanourios minor! 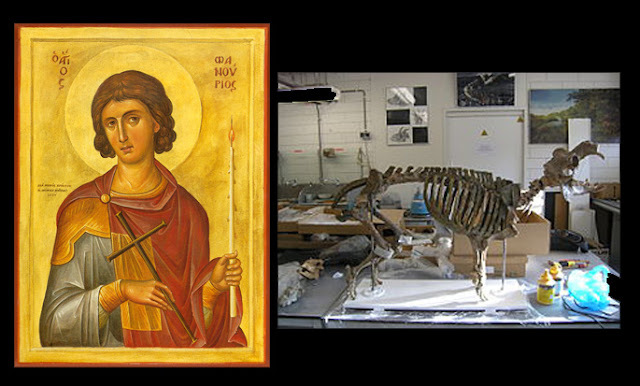 Saint Phanourios (left) and (right) a complete skeleton of the Cyprus dwarf hippo Phanourios minor. Chinese traditional medicine has long used powdered fossil bones and teeth for many conditions, including stomach problems and headaches. Preparation includes crushing the bone, and boiling for a prolonged time, followed by the addition of other ingredients. Of course, the bones have nothing to do with dragons, not even with dinosaurs, but are, instead, of fossil rhinoceroses, bears, horses, elephants, and hyenas among others. While the medicinal use of fossils might seem as something quaint and amusing from the past, it continues today in some areas. As noted above, the hippo bones on Cyprus were used until the 1970s. 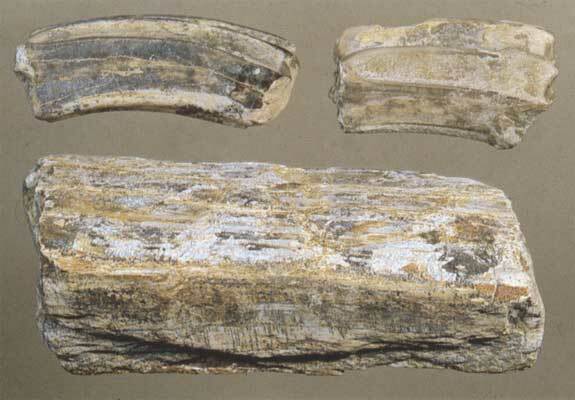 Dragon bones and teeth, even though recognized as fossils, are widely used in some “alternative” medical therapies and can be purchased on-line. Some practitioners claim that there are no known side effects of excessive dragon bone intake. 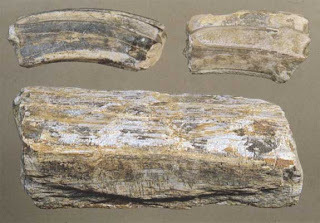 However, fossil vertebrate remains can have very high radiation levels, depending on what minerals were involved in the fossilization process. Among the most important vertebrate fossils bearing beds in the world are the Cretaceous marine beds in the Araripe Basin of northeastern Brazil. Laminated limestone quarries are where many specimens are found and at least five species of fossil turtles have been discovered. The fossil shells are scraped and given orally. Among its effects are those of a sedative. My thanks to fossil shark expert Dr. Christopher Duffin for copies of his many papers on the medicinal uses of fossils and interesting email discussions on the same. Taylor, M.E. and Robison, R.A. 1976. Trilobites in Utah folklore. Brigham Young University Geology Studies 23: 1-5. 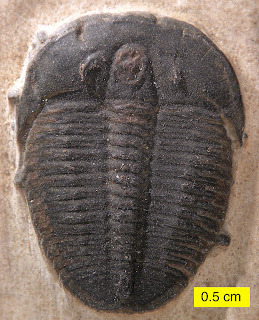 Trilobites are one of the few groups of fossil invertebrates that are easily recognized by the public. For some 270,000,000 years (from the early Cambrian until the cataclysmic global extinction event at the end of the Permian) they crawled, swam, and burrowed in the oceans of planet Earth. As arthropods they had a hard exoskeleton that was shed many times throughout their life, giving them a remarkably rich fossil record. Global in distribution, trilobites filled many niches in ancient marine ecosystems. Burrowers might be blind or have eyes perched on stalks to look around while most of the body remained hidden in soft sediments on the ocean floor. 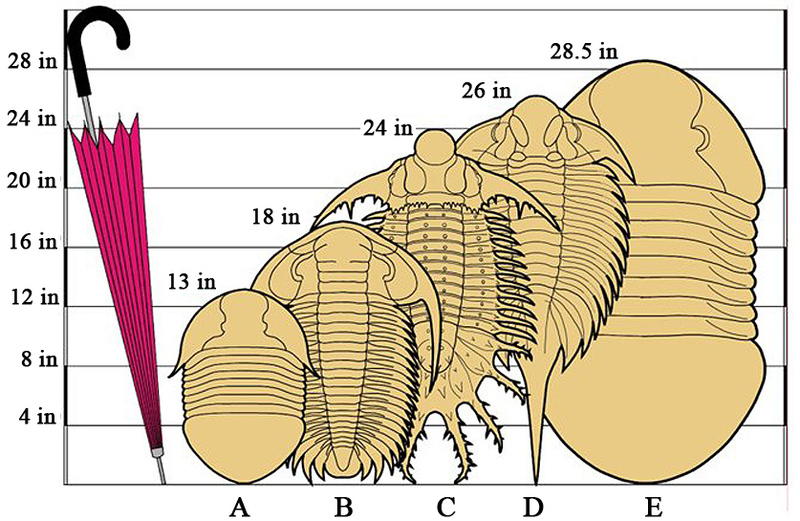 Some trilobites were smooth and almost featureless while other were covered with large spines. Some small ones had immense compound eyes that completely wrapped around their heads, cyclopean-like. These were pelagic species floating in surface waters, where good vision helped both in finding food and avoiding predators. 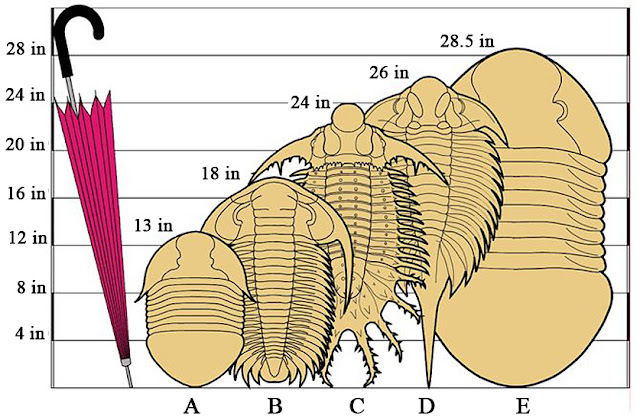 The smallest trilobites were just one millimeter long (3/64 of an inch) while the behemoth Isotelus rex reached a whopping 70 cm (28 inches). Trilobite colossi. A) Isotelus brachycephalus. B) Acadoparadoxides briareas. C) Terataspis grandis. D) Uralichus hispaniscus. E) Isotelus rex. Tens of thousands of scientific papers on trilobites have been published since that beginning and paleontologists have long studied evolution using trilobite fossils. 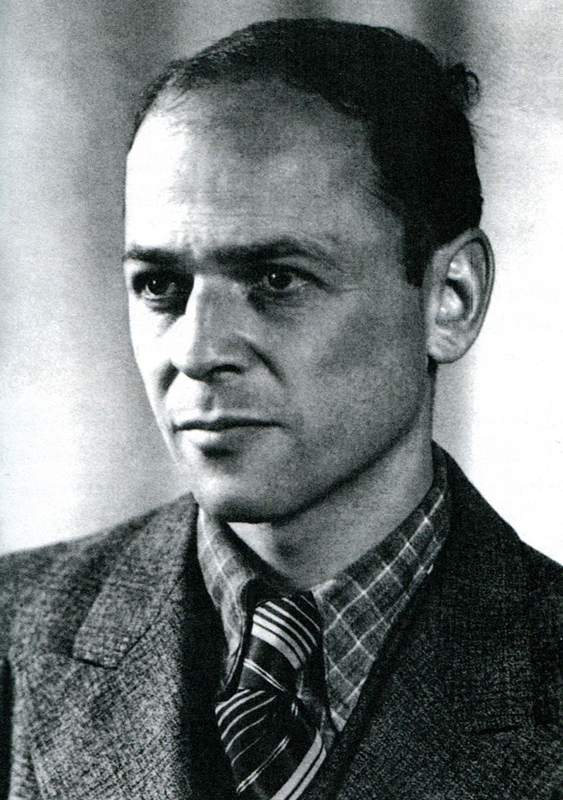 Rudolf Kaufmann was born in 1909 in East Prussia. He attended university and was well trained as a geologist and paleontologist. He is best known for his work on the evolution of the primitive trilobite Olenus, a common fossil in the Cambrian alum shales in Sweden. He collected many specimens at closely spaced intervals through a great thickness of shale. He developed a special device to measure morphological features on these specimens and was able to elucidate which features were relatively stable and which varied and changed over time. He showed that species were evolving through small but consistent trends in variation over time until another species invaded from outside the area, replaced those species, and then repeated the pattern. 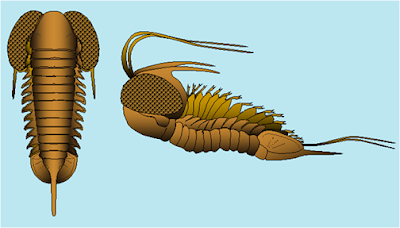 Kauffman named this evolutionary phenomenon Artabwandlung but today it is known scientifically as allopatric speciation and punctuated equilibrium. A page from Kaufmann's Ph.D. Dissertation. Kaufmann’s innovative studies, involving careful measurement, large collections, and careful field observations produced results that are still, with some modification, valid today. Kaufmann was a far seeing scientist well ahead of his time. 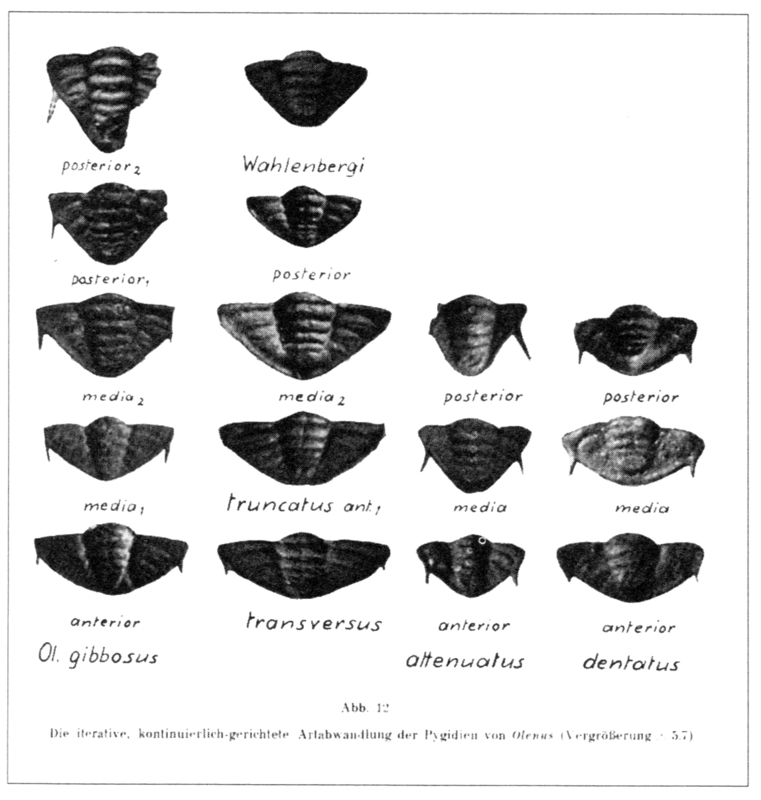 Unfortunately, he published his trilobite studies in the proceedings of the Greifswald Geological and Paleontological Institute. Because of the journal’s small circulation it remained little known in the wider scientific community. But clearly he had a bright and successful scientific career ahead of him. 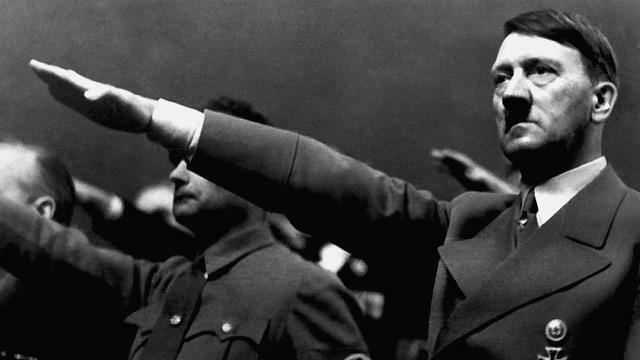 Anti-semitism was a fundamental and guiding principle of Adolf Hitler and the Nazi Party. The Nazis were not unique in their anti-semitism, anti-jewish feelings were strong and widespread in Germany (and elsewhere) in the late 19th and early 20th century. The difference is that after seizing power in 1933 the Nazi party was able and willing to develop social and political policy based on make these feelings and put that policy into practice. The latter is even more ominous that it sounds, because for a Jew a kiss, or even a hug, with a “German or kindred blood” could be construed as a sexual activity sufficient for prosecution. All this would spell catastrophe for Kaufmann. 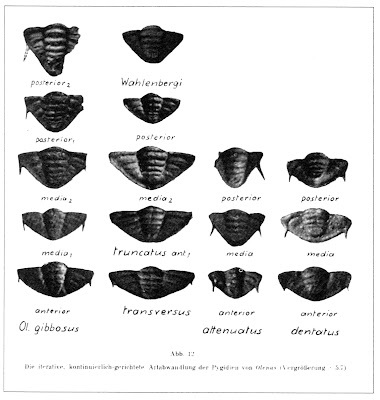 In 1933 Kauffman completed and published his Ph.D. Dissertation “Study of the Statistics of Variation Through Modification and Transformation of Species in the Upper Cambrian Trilobite Genus Olenus Dalm.” This was only a few months before the start of the Nazi regime and he settled into a position at Greifswald University. However, Kauffman was “only” a second generation Christian. Born to Christian parents, he had been baptized an evangelical Christian. But he was of Jewish descent so his family’s conversion and baptism now counted for nothing. He would never find a position in Nazi Germany and Jewish scientists without substantial experience were not wanted abroad via emigration. He was dismissed from Greifswald in 1933 and left for Copenhagen. While denied a scientific career there, he was able to support himself through his hobbies as a photographer and a certified sports and athletics instructor. As conditions in Copenhagen deteriorated he migrated to Italy where in the summer of 1935 he met Ingeborg Magnusson, a 28 year old Swedish citizen vacationing in Italy. They fell madly in love, a romance that lasted six years. However, because of the onerous restrictions placed on Jews in Germany and German controlled territory, Rudolf and Ingeborg would only spend 13 days of those years together. In 1935 Kaufmann returned to Germany to teach biology, geography, physics, art, and gymnastics at the Preacher Hirsch Boarding School, a Jewish school where, ironically, being an evangelical Christian didn’t matter. Over time Rudolf grew closer to Judaism, not as a religion, but as a realization that it was the only group that would accept him, even though he did not renounce his Christianity. But life was different now and his past friends and scientific colleagues avoided him. The Preacher School was in the city of Coburg --- the first German city to elect a Nazi as mayor and that as early as 1929. He continued to seek employment as a geologist, but to no avail. However, he and Ingeborg continued to write lovingly to one another and from time to time they were able to meet outside of Germany to spend a few fleeting days together. In May of 1936 Kaufmann attended a local dance for relaxation and there met a young widow from Neues. They struck up a friendship that led, in a weak moment, to a sexual liaison. Later Rudolph realized that he has contracted a venereal disease. While seeking medical treatment from a local doctor specializing in venereal diseases Kauffman revealed who infected him --- a fatal mistake. The doctor knew that Kaufmann was legally a Jew and that the woman was of German blood. Both Rudolf and the woman were arrested. “ARRESTED FOR OFFENSES AGAINST THE RACE LAWS. TYPICAL CASE OF JEWISH EFFRONTERY IN COBURG. The woman, viewed as a victim of Jewish deception because Kauffman didn’t identify himself as a Jew and “didn’t look Jewish”, was released. Kauffman was put on trial and in December was sentenced to three years in prison and five years revocation of his civil rights. 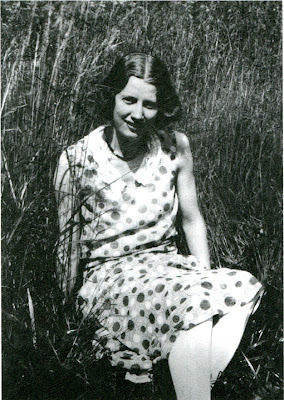 Kauffman, in a letter to Ingeborg, confessed to his one true love what has happened and concluded his letter with “Forget me because I have brought shame on you and everyone.” Remarkably, Inge forgave Rudolf and continued writing to him, even hoping to find some way to have him come to Sweden. Upon losing his appeal, Kauffman was transferred to Amberg Prison, where he worked as part of a crew building the Reich autobahn. Remarkably, in the prison he had access to scientific journals and was permitted to learn English although not to write, so his trilobite essays came to a halt before completion. War broke out in Europe on Sept 1, 1939 when German military forces swarmed across the Polish border. Because of those hostilities, all Jewish prisoners lacking emigration permits were supposed to kept in prison or sent to camps upon release. Fortunately, because of paperwork confusion, Rudolf was simply released from Amber Prison on 12 October 1939 and was eventually able to emigrate to Lithuania. Always the paleontologist, he worked, unpaid, preparing fossil fish at the Geological Institute of the University of Lithuania, hoping that it might lead to a paying position. But no work permits were being granted to immigrants in Lithuania. Nevertheless, he found time to write a paper on trilobites for a geology conference. In 1940 the Red Army invaded Lithuania, bringing the country under the control of Russia. Remarkably, within a month of the creation of the Lithuanian Socialist Soviet Republic, Rudolf secured a paying position as a geologist. But the struggles of the last several years took a great physical and emotional toll and Kauffman eventually lost his optimism about everything turning out okay in the end. It had been four years since he last saw Inge and depressed and worn down, he finally accepted that they would never be together. In October 1940 Rudolf wrote to Inge and revealed that he has met another woman. In November he swrote of marrying her. Inge’s reaction is unknown, but Rudolph continued writing to her throughout the winter as he oversaw up to 80 men on geological surveys. His last letter to Inge is dated April 23, 1941. On June 22 1941 the German army invaded Russia and its satellite states, including Lithuania. Mobile SS execution squads follow quickly behind the army, beginning systematic genocide in the country. A German army roadblock near Dusseldorf. Kaufmann was protected by the Lithuanians and continued his geological work for them. However, sometime before July of 1941, as part of his field studies, he borrowed a bicycle from a friend and took country roads to a rock quarry. One the way he was stopped by two German soldiers at a road block. Ironically, the fiancée of one of the soldiers had worked as a domestic in the Kauffman’s parent’s house many years ago. Recognizing him, the soldier called him out as that “Jew Kaufmann from Konigsberg”, then shot and killed him. In the Spring of 1984 a burglar broke into the Skeppargatan building, a Stockholm apartment building undergoing renovation. Among the items stolen from storage in the basement were cartons of old letters and envelops. At some later point these letters, bearing stamps from the 1930s and 1940s, moved into the world of stamp collectors. In 1991 Reinhard Kaiser saw a package of stamps, envelops, and other items selling as a unit in a German sales catalog for an auction in Frankfurt. Viewing the items, he noticed that some thirty of the envelops contained letters written between 1935-1939 and mailed from various cities to a woman in Stockholm. As Mr. Kaiser would write later “I took the carton I had bought home, eager to find out what it contained, but unprepared for a story that would not loosen its hold on me for years.” He had, unknowingly, purchased some of Kauffman’s letters to Ingeborg. He spent years investigating the letters, tracking down and interviewing still living relatives and friends of both Inge and Rudolf, finding additional letters by Kaufmann, and uncovering the details of the tragic story of two lovers during one of the worst periods in human history. He published the story in 1996 as a book Konigskinder. 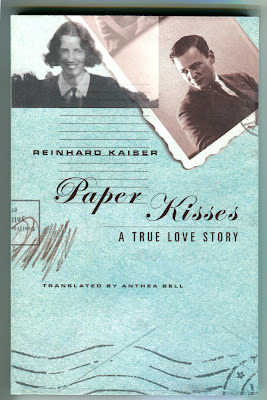 It was translated by Anthea Bell and published in English in 2006 as Paper Kisses: A True Love Story. Though just a mere 112 pages, the book is filled with the details of Rudolf and Inge’s romance and extensive extracts from the letters. Inge’s letters to Kaufmann have not been found. If Kaufmann kept them, which is likely, they were probably lost after his murder, so we can only follow one side of the tale. But the book is still well worth the read. Knowing how the story ends only makes the letters more poignant as love blooms, history intrudes, and tragedy unfolds. Ingeborg Magnusson never married. She died in 1972. It was her collection of letters from Kauffman, then in the hands of her sister Greta Magnusson, that were stolen from the Skeppargatan basement in 1984. Bergen, D.L. 1996. Twisted Cross: The German Christian Movement in the Third Reich. The University of North Carolina Press. 360 pages. Fortey, R. 2000. Trilobite! Eyewitness to Evolution. Alfred Knopf, N.Y. 320 pages. Harrington et al. 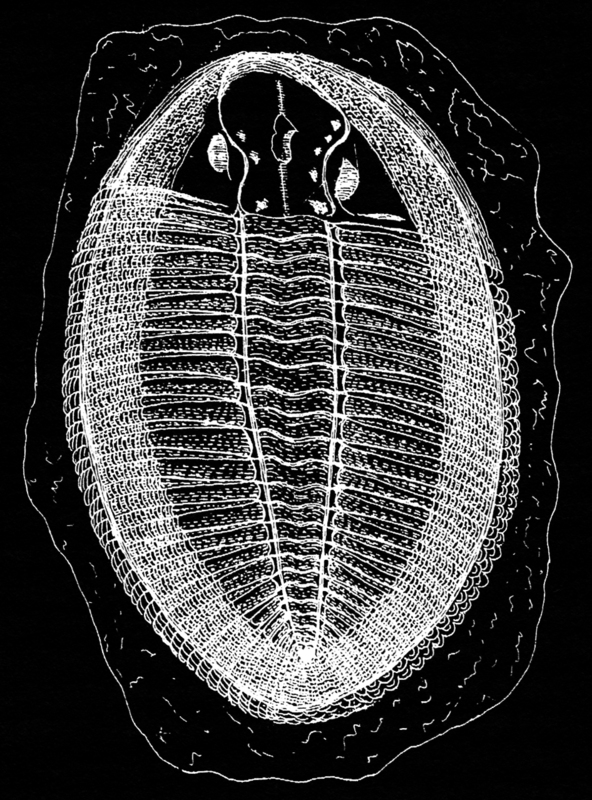 1959: Olenus trilobite in Header.